Postmaster: Cleveland, Ohio; 19?? to ? 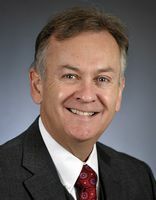 He ran unsuccessfully for the Republican party endorsement for the United States House of Representatives in Minnesota's 1st Congressional District in the 2014 election. Busse, Nick. "Cutting Through the Red Tape." Session Weekly, St. Paul: Minnesota House of Representatives Information Office, February 4, 2011, p. 17.